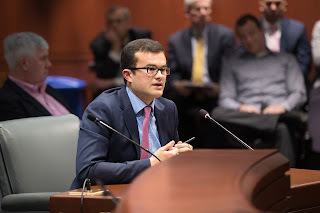 State Senator Art Linares announced that the legislature’s Appropriations Committee approved a bill he requested to study the long-term financial impact of state employees’ and elected officials’ pay and benefit compensation on the state. The bill now moves to the Senate for consideration. Sen. Linares said a review of state employee and elected officials compensation could examine ways to save money when the current state employee contract ends in 2027. Currently, more than 1,400 retirees collect annual pensions in excess of $100,000, Sen. Linares said. The highest paid retiree received more than $300,000 a year. Sen. Linares said he also believes the lowering the expected return on investment in the fund from 8percent to 6 percent should be considered. The 10-year return for the 41 largest state pension funds was 6.59 percent.